Like many of you farmers out there, I’ve been struggling to get my soybean harvest complete. So far, yield loss has not occurred. If freezing ice does happen, however, it could inevitably become an issue for myself and other farms near by. Longwell’s New Holland TR86 combine harvesting soybeans during the nighttime. As I run the combine late into the night, I am constantly evaluating how I could be making adjustments accordingly to speed the process up. When I’m running soybeans, I’ve learned that if my fields are not as dry as I’d like them to be, I will lighten up my header-control. This keeps it from pushing up mud onto my soybeans. If I have the header-control set too aggressively, though, it will push the mud onto the soybeans. Header-control helps the soybeans follow the contour of the ground, but if it’s too aggressive, it will start pushing the bean head into the mud. I have found that slowing the bean-head reel speed as much as possible decreases shattering. Although the soybean stems are dry and they run through the machine smoothly, the grain moisture is still higher than desirable. This has made me look closely at grain elevator discount rates. I urge farmers to take advantage of every opportunity available to them. Check around on elevator dockage and grading on soybeans. It varies within each elevator. The key thing about late harvesting soybeans seems to boil down to one crucial factor: the weather. It seems that if the weather conditions are held in the farmer’s favor, there is a given opportunity for a few days of field work. The downside to this is that the time frame for these few days of field work is limited. Corn, on the other hand, is susceptible to weather conditions. 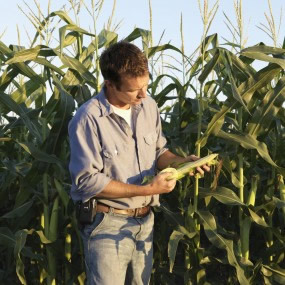 Corn will handle a later harvest in the season than soybeans would. Since the corn stalks are much taller, the snow and ice which falls to the ground does not impact the grain to be harvested. 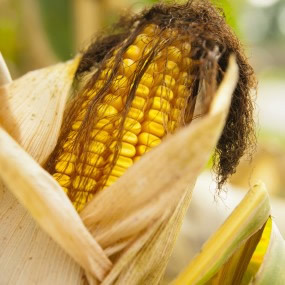 Corn also does not pick up as much moisture from the environmental weather conditions as soybeans do. After harvesting, you want to be able to evaluate your fields and the aftermath of the weather season. Ruts in the fields need to be corrected quickly. Just like late harvesting soybeans, there is a small window of opportunity to correct the torn-up fields. With fall tillage, the window of opportunity is even less, due to weather and changing seasons. Plowing should only be done when the field is dry. It needs to be dry enough to do an adequate job of fall tillage. Many farmers have finished harvesting or are close to it, but I believe that some will not be completed until after Christmas.